On the surface, gating your content behind a form seems like a pretty straightforward way to increase your lead generation – in fact, when you get to the end of this article you’ll have the option to sign up to download one of our coolest new content pieces. You tell people you have some awesome content, they hand over their information to get it and, voila, a new customer is born. Unfortunately, the effectiveness of gating content isn’t that simple. In reality, gated content can be a tricky science – and if not done right, in can actually drive people away from your business, instead of bringing them in. Want to know why your gated content might not be working for lead generation? Check out the 10 reasons below. 1. The form is too long or complicated. You need to ask for contact info in the most simple and straightforward manner possible. If you make your gated content form too complicated or involved, they may decide they don’t want to take the time to fill it out – and simply abandon it completely. Consider the layout of these two signup forms – Which would you be more likely to complete? 2. It isn’t presented contextually. The most effective gated content is presented contextually on a website or blog. This means that when you offer something that is gated, you present it in a place where users are already experiencing or consuming something related (e.g. offering a downloadable travel itinerary for a week in New Orleans on New Orleans travel blog.) People probably want more info on a topic they are already researching. However, if you present a piece of gated content in a context that is completely unrelated to its subject matter (e.g. a downloadable travel itinerary for a week in New Orleans on a blog about lawn mowers) , they won’t be as interested in finding out just what is behind that gate. 3.The form asks for information that is too personal. A Hubspot study on lead generation showed that forms become less effective when they ask for things like “age” and “telephone number.” When you’re designing a form for gated content – stick to only the basics (like name and e-mail). Asking more personal questions may feel too invasive and cause people to jump ship. 4. Your form is too easy to fake. When some people come upon a gate, they may be tempted to provide false information in order to get at the content. If you make it easy to enter false information, you may just end up with a database of gibberish and e-mail addresses that don’t exist. Try incorporating a verification step into your gating. While it may be one extra step for users, you’ll end up with lead information that is much more useful and accurate. 5. The content behind the gate isn’t actually that valuable, so people don’t share it. You might think whatever eBook, slide show, white paper, etc. you want to put behind a gate is awesome (and it probably is). But in order to actually get people to hand over their contacts, the piece needs to have real value to it – and it needs to be something that people can’t find somewhere else on the web for free. Before you put something behind a gate, do a little Googling and make sure that what you’re about to release doesn’t already exist so you boost the chances that people are going to sign up and also share it. Unfortunately, the Internet can be a shady place sometimes, and it’s possible to have content – event stuff you put behind a gate – scraped by bots (or humans). Once your content is scraped, it may appear on other websites (not your own) for free, so that it helps those generate traffic (and money). If you see a dropoff in potential leads (or people stop filling out the form to get your gated content), it may be that your content now appears for free somewhere else. To avoid being scraped by bots, include questions on your form that can only be answered by humans. 7. It can’t be found on search engines. Gated content can be tricky because if it’s behind a form, search engines can’t read it – which means it can’t show your page as a result in searches. You should add SEO help to your gated content by creating preview or summary pages of the content, which search engine bots pick up on. 8. You don’t remember repeat customers. If you’re doing things right, you probably have loyal followers that come back to your site regularly to check out your content. If someone has filled out a form for gated content once, make sure you allow them to login or bypass the form – making them answer the same questions twice may drive potential customers away. 9. You are gating content for customers at the top of the sales funnel. When buyers are at the top of your sales funnel, your content should be given freely and centered on general information about how to solve their problems or answer their questions. Once they are ready to learn more, they have moved to the middle of the sales funnel — and now the information you give them should be more specific about your company: how can YOU specifically help them solve their problems or answer their questions? The middle of the funnel is where you want to start differentiating yourself from all the other options out there, this may be a good point to start gating – but doing it too soon may send potential customers running in the opposite direction. 10. You don’t communicate clearly about what users can expect. When someone considers giving you their contact information for a piece of gated content, they probably also expect that they’re going to get a bunch more e-mail from you – and this can turn potential customers off. One good way to ensure people feel comfortable handing over their contacts is that you are very clear with them about what you will and won’t send them once you have their info. This way they know what to expect. Gated content isn’t always simple to get right, but once you master it, it’s an excellent way to generate leads and build your business. 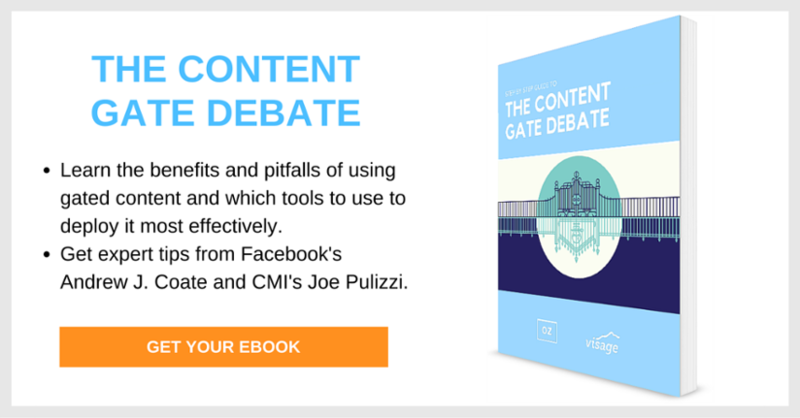 Check out this comprehensive guide to gated content presented by Oz and Visage to understand how you can create awesome gated content that works – trust us, it’s worth it. We interviewed industry all-stars and wrote an ebook to help you determine how to create and deploy the most powerful gated content.